DUBAI(WAM)—Emirates Airline has announced yet another record performance with net profit for the first six months of the current financial year 2006-07 reaching Dhs 1.2 billion (US$323 million), up 29 percent compared to Dhs 922 million (US$251 million) posted in the same period last year, while rival Gulf Air is expecting to make a loss for the second straight year. The Dubai government-owned airline company's outstanding revenue performance has been achieved thanks to a strong passenger and cargo demand which offset higher fuel costs. Emirates chairman Sheikh Ahmed bin Saeed Al Maktoum said "Emirates has been in a strong position to tap into the robust demand for air travel globally by expanding its route network with new high-capacity aircraft"
"Emirates has delivered another excellent half-year performance, maintaining capacity and revenue growth despite the challenges faced by high fuel costs," said Sheikh Ahmed adding that the award-winning airline had been in a strong position to tap into the robust demand for air travel globally by expanding its route network with new high-capacity aircraft, and investing in passenger services such as dedicated airport lounges across Europe, the Far East and Australasia." However, rival Gulf Air's profits have been seriously affected by high fuel prices despite introducing an aggressive marketing strategy to increase number of passengers. Gulf Air chairman Abdul Aziz Kanoo said that "revenue is expected to be up by at least five percent over last year and passenger figures via the airline's two hubs, Bahrain and Oman, are up 31pc so far this year." However, Kanoo added that the airline would make a loss for the second year running because of high fuel costs. Emirates' operating revenue of Dhs 13.5 billion (US$3.67 billion) for the half-year represented a strong growth of 30 percent compared to revenue of Dhs 10.4 billion (US$2.84 billion) during the same period last year. The International Air Transport Association has said Middle East passenger traffic in the first nine months of the year rose 15.4 percent, the fastest of the world's regions, according to an industry association which represents 260 airlines. The number of passengers Emirates carried in the first six months rose by 20 percent to 8.39 million, compared with 6.98 million in the year-earlier period, it said. Passenger revenue rose 31 percent and load factor, the proportion of seats filled, to 76.4 percent, it said, without giving comparisons. 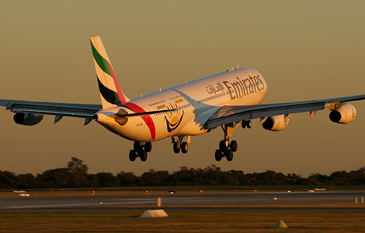 Emirates SkyCargo continued its steady revenue growth, recording an increase of 29 percent to Dhs 2.7 billion, with cargo tonnage up by 20 percent to 577,455 tonnes, compared with 482,643 tonnes for the same period last year, and maintained its contribution at about 21 percent of the airline's transport revenue. Gulf Air, established more than three decades ago by four Gulf Arab states (but only Oman and Bahrain in the present time), became the first casualty of tough competition from emerging airlines. Gulf Air, which covers some 50 cities in more than 30 countries, notched up debts of 700 million dollars to the end of 2002, forcing its co-owners to pump in 238 million dollars and defer debts. It launched a three-year strategic recovery program in 2003 under the direction of former President and CEO James Hogan - an Australian former airline CEO in Australia and Britain who took over the previous year- but stepped down in July.